Numerics for iPad Pro is here! We know our users love using Numerics on large screens. So we have been working really hard behind the scenes to design a unique new experience for the iPad Pro and are proud to announce its availability along with Apple’s launch of the awesome iPad Pro. We are excited to announce today, a huge Numerics update with support for the iPad Pro’s large screen and various optimizations for multi-tasking on the new device. 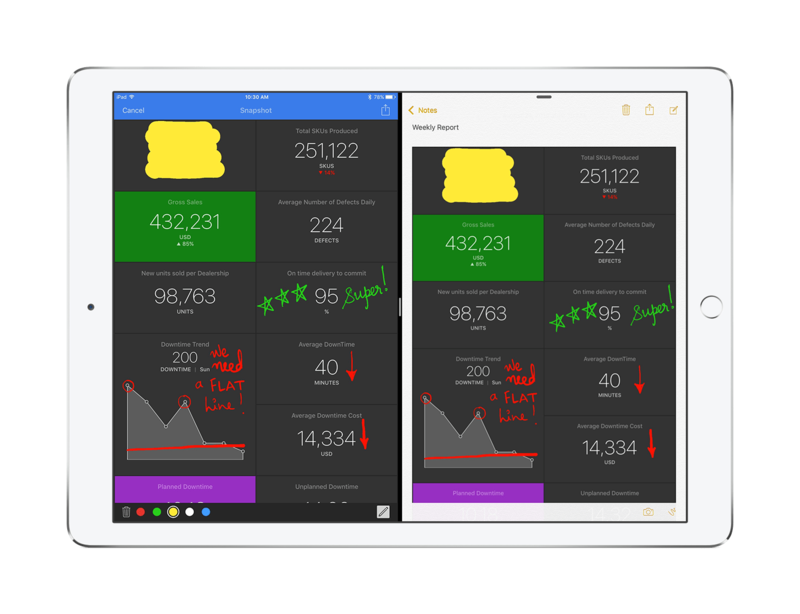 With Numerics v4.2, we’re introducing a brand new Markup feature to annotate dashboards with support for the Apple Pencil. The iPad Pro’s big screen and big processing power allows a much better user experience for Numerics, while multi tasking and the Apple Pencil enable unprecedented collaboration features that we think you will fall in love with! 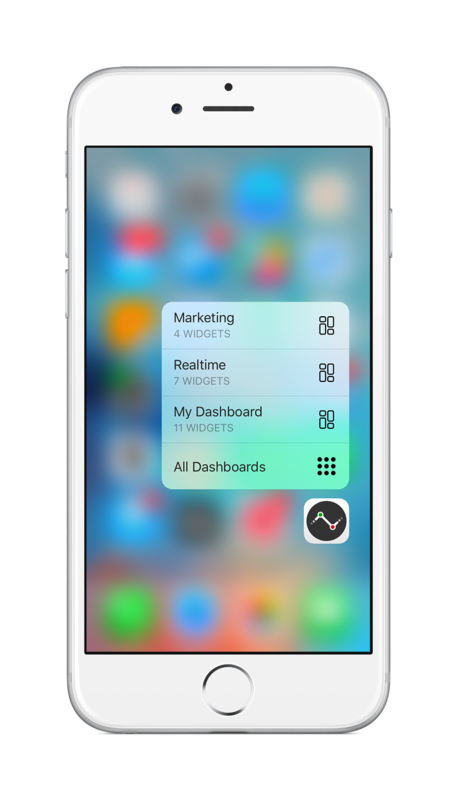 Numerics v4.2, also adds 3D Touch Support for iPhone 6s & iPhone 6s Plus and integrates with a new service - Intercom, to bring in your customer interaction and acquisition statistics into Numerics. Numerics has been optimized for the iPad Pro’s large canvas size. With the highest resolution Retina display, the iPad Pro’s screen fits upto 24 of Numerics’ widgets, double the number of widgets that fit on the regular iPad screen before scrolling. 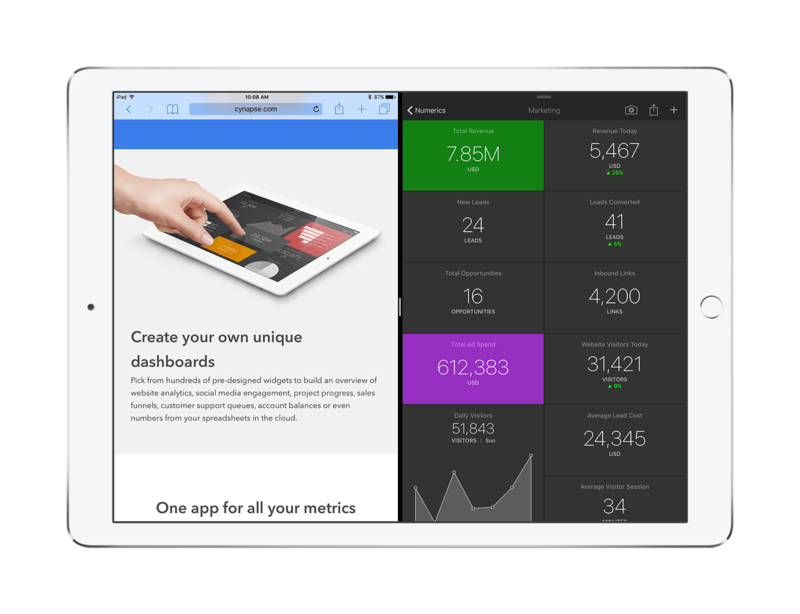 Numerics, unlike any other dashboard app, does a direct device-to-service connection to aggregate, process and present dashboards. There are no servers in the middle. While all of our competitors replicate your data on their servers to process it there to create your dashboards, Numerics does all of it on your device in real time. This makes Numerics secure by design and more compliant with strict security policies, but it also means more work for the device. iPad Pro’s powerful hardware and the A9X chip makes the experience of using Numerics with large number of dashboards and widgets buttery smooth! We are introducing a brand new feature with v4.2 - Dashboard Markup. Until now, you could take a snapshot of a dashboard or a widget in Numerics and share them as reports with colleagues to collaborate further. Now, you can share further insights and observations by adding annotations or highlighting important numbers on the dashboard snapshot before sharing it. You can annotate using your finger or using the new Apple Pencil on the iPad Pro. Numerics takes advantage of Apple Pencil’s pressure sensitivity and tilt detection making your annotations feel more expressive and natural. The strokes are thicker when more force is applied and thinner when you write fast. Further, if you tilt the Apple Pencil to over 70 degrees, as if you are shading, the pencil turns into an Obfuscator. In this mode, the strokes become broad and thick and can be used to obscure any numbers or widgets you don’t want to share in the snapshot. It’s just like using a white ink marker on paper to hide selective text! Numerics 4.2 has been optimized for Multitasking on the iPad Pro with the Split View and Slide Over modes which allow you to use Numerics and any other app at the same time. Widgets on the dashboard adapt and reflow to fit each of the different split view scenarios uniquely. As a secondary app in the slide over mode, Numerics works in a fully functional compact mode and is super useful for keeping an eye on your numbers while working on other stuff. Numerics supports multitasking on the iPad Pro in all modes in both Landscape and Portrait. Multi-tasking coupled with Annotations in Numerics is perfect for creating and collaborating on reports out of Numerics. Simply launch Numerics alongside your productivity app for e.g. a Keynote presentation or Microsoft Word in one of the multitasking modes, take a snapshot of your dashboard in Numerics, mark it up, copy the snapshot and paste it into the Keynote slide or word document. Voila! You have an insightful report ready to use in a few taps. You could do the same with any other productivity or collaboration app that supports pasting of images alongside Numerics. We think multitasking along with annotations on the iPad Pro is going to be something that a lot of our users are going to find super useful for their frequent report creation workflows. Numerics v4.2 also adds support for the new gestures introduced on the iPhone 6s and iPhone 6s Plus with 3D Touch. Numerics launches into the last used dashboard by default. You can now directly launch Numerics into one of your top 3 dashboards or jump to the full list of all your dashboards using the new Quick Actions, accessed by pressing the Numerics app icon on your home screen. This version introduces a new service integration - Intercom. 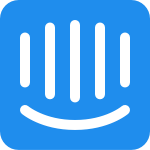 Intercom is a popular customer communication platform that website owners and app developers use to support and interact with customers. Numerics v4.2 adds 4 Intercom widget packs - User Stats, Admin Stats, Company Stats and Conversation Stats with 25 pre-designed widgets giving you some great insights presented in intuitive pie charts, funnel lists and number tallies. The User Stats widget pack gives you an overview of the user segments and tags you have defined, while the Admin Stats can give you a good idea of the performance of the admins interacting with your customers. Company Stats provide widgets that give you deeper insights of your customers within individual companies based upon your segments and more. Conversation stats gives you the overall health of the customer conversations. 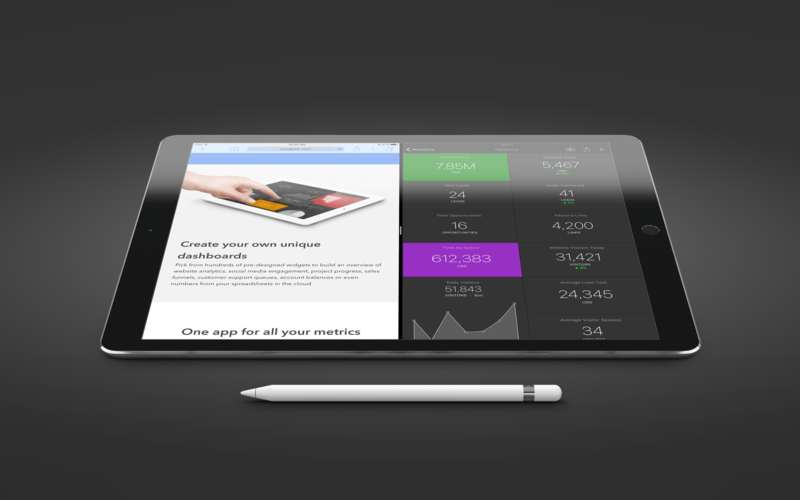 We are thrilled that Numerics is available on the iPad Pro on launch. 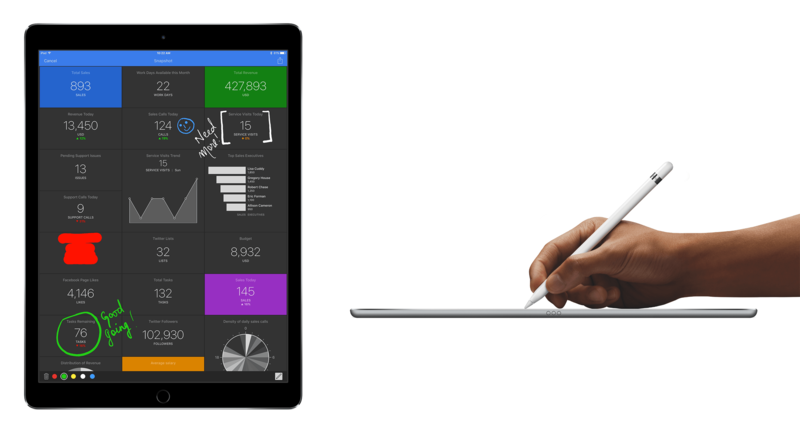 We hope you enjoy using Numerics on the iPad Pro along with the Apple Pencil. For a limited time, we have dropped the price of Numerics by 50%. If you haven’t tried out Numerics yet, get it now!